When you think of making a nutritional change, does your skin crawl? Do you automatically think about how hard it will be to add something to your routine or modify your cooking methods? Even as a registered dietitian, I THRIVE on routine and predictability. I continually talk to my clients and students about adding protein, fiber and micronutrients (vitamins and minerals) to their diet. They want to know how to make it easy and make it stick. I often tell them, the key isn’t overhauling their diet, but making small manageable modifications over time that can easily be incorporated into their lifestyle. You’ve heard me talk about Ultragrain® and its health benefits for years as a white whole wheat flour that’s easy to use, instead of white flour, in baked goods, soups or snacks. 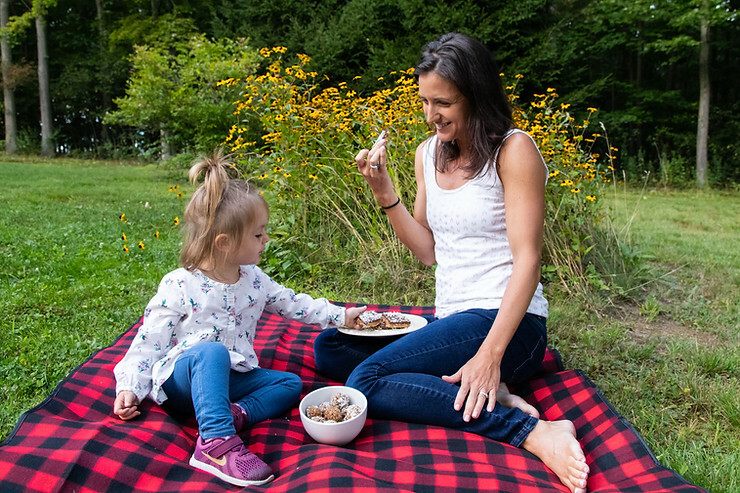 The good news is that Ardent Mills offers other consumer friendly products that can be just as easy to incorporate into your routine to make healthier breakfasts, snacks and side dishes. One of their newest initiatives, The Annex™, which is now the overarching heading for “better for you grains”, including ancient and heirloom grains like puffed quinoa. I had never heard of “puffed” quinoa until recently. The exciting news is that it has all of the health-benefits of quinoa, in a crispy, puffed version that both kids and adults love! It adds a healthy crunch to yogurt, smoothie bowls, oatmeal, granola bars or any other healthy snacks! Just a few of its amazing attributes are shown below! A single serving of approximately 1.8 ounces provides seven grams of protein, or as much as one egg. In addition, it’s considered a complete protein, providing all nine essential amino acids that help with growth and repair of muscle tissue. This makes it the perfect addition to any meal where you’re looking to get the amount of protein we know helps keep you full and satisfied (approximately 20-25 grams total) or to any pre- or post-workout snack! Adequate iron can be a difficult mineral to obtain in bioavailable quantities (i.e. the amount that gets absorbed and used by your body), especially for certain groups like young children, pregnant and premenopausal women and athletes. Recommended dietary requirements range from 11-14mg/day in children 2-11 years and 17-20mg/day in men and women over 19 years. This mineral is essential to produce red blood cells and helps aid in their ability to carry oxygen to working muscles. Just one serving of 50g of puffed quinoa supplies 2mg of iron or up to 11% of your daily value for females over the age of nineteen. Fiber is just one of those things I can’t stop talking about when I discuss nutrition. When you eat foods with fiber, it helps you control your rise in blood sugar after a meal, improves your digestive system motility and helps feed the good bacteria in your gut. At 3 grams/serving, puffed quinoa can help contribute to your overall needs of 25-35grams per day for men and women. Fiber also helps you stay feeling fuller, longer, which helps control appetite and keeps you satisfied. Just a few of the ways you can incorporate this tasty whole-grain into your diet are as an energy snack in your lunch or the lunchbox of those you love, as a topping on cereal or yogurt, in homemade bars or granola or just as a handful in the car when you get "hangry"! I made the recipes below in an afternoon and they were easy, nutritious and Emma and I loved the taste! 1. Heat coconut oil in a medium size sauce pan on low/medium heat. 2. Mash the pitted dates with a fork and add to the sauce pan with the nut butter. Stir until it all comes together and cook for just a few minutes on low heat. Remove from the heat. 3. Add pumpkin seeds, puffed quinoa and sliced almonds. 4. Line an 8 x 10 inch baking dish with parchment paper and scoop the batter into it. Use the palm of your hands to press everything together tightly into an even rectangle, roughly 2/3 inch / 2 cm high. 5. Put in the fridge or freezer while you melt the chocolate in a saucepan or microwave. Pour the melted chocolate over the bars and use a spatula to distribute it evenly. 6. Sprinkle with coconut and put back into the fridge or freezer until cold and firm. You can store them in an air-tight container in the freezer for months or the refrigerator for about a week. Nutrition Facts (Amount per one bar serving): 136 calories, 10g fat, Cholesterol 0mg, Sodium 77mg, Potassium 145mg, Total carbohydrate 10.4g, Dietary Fiber 2g, Sugars 6g, Protein 4.6g. You Can Coat Them In Coconut or Leave Them Plain! 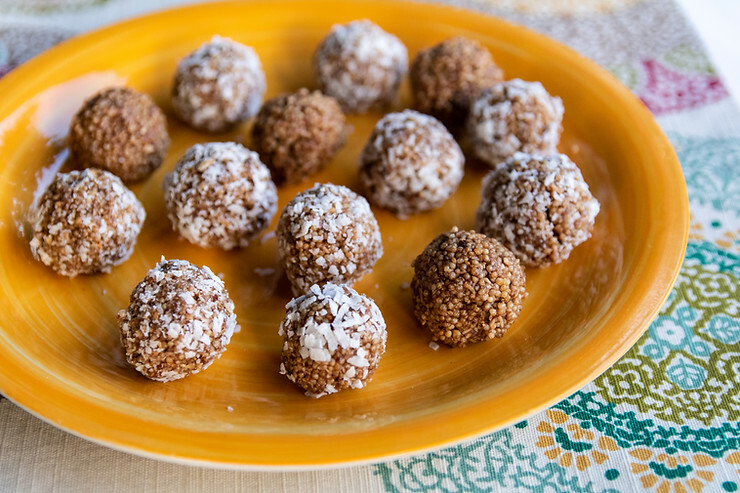 Recipe makes 16 energy balls. 1. Combine oats, dates and chocolate in your food processor or blender. Blend on high until the mixture resembles coarse crumbs. Transfer crumbs to a large mixing bowl and stir in puffed quinoa. 2. Combine almond butter and honey in a small saucepan and cook on low heat, stirring occasionally, until the mixture is well combined and barely reaches a light simmer. Pour into the mixing bowl and stir all ingredients with a spatula until blended. 3. Chill in refrigerator for approximately 30 minutes to 1 hour to set balls and allow them to hold shape. Store in air-tight container or freeze for future use for up to two months. Nutrition Facts (Amount per one bar serving): 90 calories, 4.4g fat, Cholesterol 0mg, Sodium 3mg, Potassium 49mg, Total carbohydrate 15g, Dietary Fiber 2g, Sugars 8g, Protein 2g. 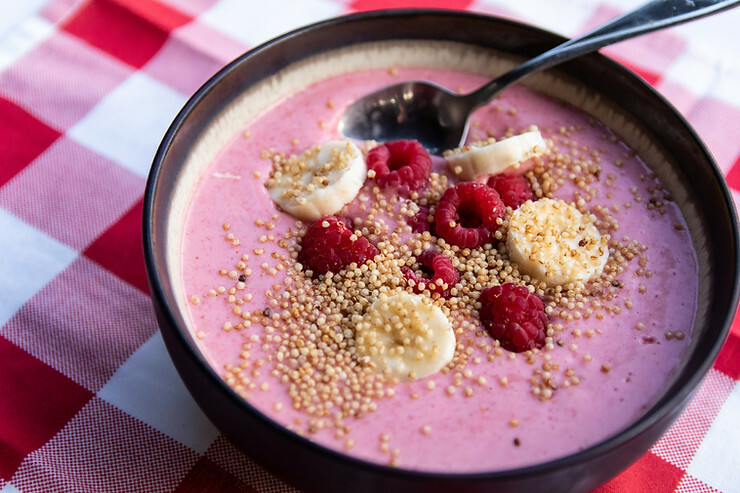 A Smoothie Bowl Is Delicious For Breakfast or a Snack! 1. Using a blender, combine the first ingredients and blend to desired consistency. Garnish with raspberries and puffed quinoa on top! Enjoy! Nutrition Facts (Amount per one bar serving): 190 calories, 1.9g fat, Cholesterol 0mg, Sodium 45mg, Potassium 220mg, Total carbohydrate 43g, Dietary Fiber 10g, Sugars 28g, Protein 12g. We Hope You're Enjoying Fall! 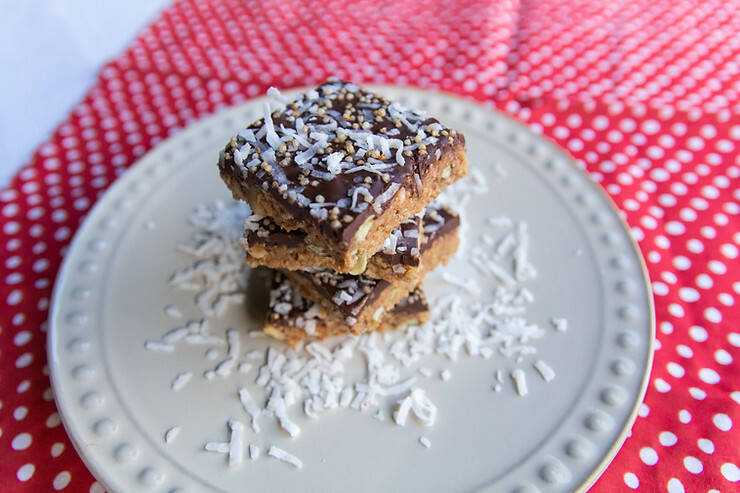 I hope you'll try out some of these fun easy recipes made with puffed quinoa that will easily upgrade your nutrition without overhauling your diet! Let me know how they go!